For the arena in Bruce, Australian Capital Territory, see AIS Arena. 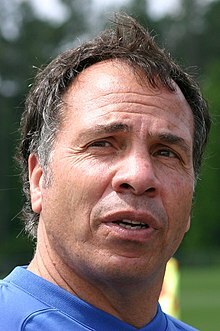 Bruce Arena (born September 21, 1951) is an American soccer coach. He is a member of the National Soccer Hall of Fame and the NJCAA Lacrosse Hall of Fame. Arena has had a long and distinguished coaching career and is considered to be one of the most successful coaches in North American soccer history, having won five College Cup titles and five MLS Cup titles. He was head coach of the U.S. at the 1996 Summer Olympics, the 2002 FIFA World Cup and the 2006 FIFA World Cup, head coach of the New York Red Bulls, D.C. United, and LA Galaxy in Major League Soccer, and coached the University of Virginia to several college soccer championships. He is the U.S. soccer team's longest-serving head coach. Before beginning his coaching career, Arena was a goalkeeper for Cornell University, and earned one cap with the United States men's national soccer team. Arena was born in Brooklyn, New York, to Italian immigrant parents (from Calabria), and grew up in the Long Island town of Franklin Square, New York, where he attended Carey High School. While he excelled at several sports, he was too small for American football, so he joined the school's soccer team as a defender. He moved into the goal when the starting goalkeeper was suspended after hitting another school's player during a game. While in high school, he also played a single season with local club Hota S.C. of New York City's Cosmopolitan Soccer League. After graduation, he began his collegiate athletic career playing both lacrosse and soccer at Nassau Community College, a two-year college near his home. Arena was a 1970 and 1971 Honorable Mention All-American lacrosse player and an All-American soccer player. He was inducted into the National Junior College Hall of Fame in 2008. While at Nassau, he played soccer for head coach Bill Stevenson and goalkeeper coach Shep Messing, a future New York Cosmos goalkeeper. At the end of his two years with Nassau, Arena transferred to Cornell University in upstate New York where he was a 1972 Honorable Mention All American and a 1973 Second Team All American in lacrosse. He did not originally intend to play soccer, but injuries to the school's first and second string goalkeepers led to the men's soccer coach, Dan Wood, to recruit Arena into the team as its goalkeeper. Arena backstopped the Cornell Big Red soccer team to the 1972 NCAA Soccer Championship Final Four and earned Most Valuable Defensive Player honors for the tournament. After graduating from Cornell, New York Cosmos drafted Arena in the fifth round of the North American Soccer League college draft. The Cosmos released him before the season. Arena then signed to play professional lacrosse for the Montreal Quebecois, spending a single season with the team in 1975. The National Lacrosse League folded at the end of the 1975 season, leaving Arena unemployed. At the same time, Dan Wood, who had recruited Arena to play for the Cornell soccer team, had been named the new head coach of the expansion Tacoma Tides which played in the American Soccer League. Wood contacted Arena and convinced him to move to the Pacific Northwest to play for him. While Arena was the second string goalkeeper behind starter Jamil Canal, the move to Tacoma was significant in that it introduced Arena to coaching. That year, in addition to playing for the Tides, Arena coached the men's soccer team at the University of Puget Sound. In 1973, he earned his only national team cap as a second-half substitute for Bob Rigby in a 2–0 loss to Israel. National team coach, Gordon Bradley, had called Arena into the national team for an earlier game against Haiti, but Arena could not get time off from his job teaching at a local junior high school. In addition to his single cap with the U.S. soccer team, Arena also played for the national lacrosse team which won the 1974 World Lacrosse Championship and finished runner up in 1978. In 1977, Arena moved back to teach at Cornell and act as the school's assistant lacrosse coach. While he was there, the University of Virginia (UVA) advertised for two open coaching positions – head soccer coach and assistant lacrosse coach beginning the 1978 season. Arena took that opportunity and would go on to coach both the UVA lacrosse and soccer teams for seven years, before becoming the school's dedicated soccer coach in 1985. Arena was the head coach of the Virginia program for eighteen years, during which he won five national championships (including 4 straight from 1991 to 1994) and amassed a 295–58–32 record. Additionally, he coached and developed many players at Virginia who would go on to play significant roles in the United States national team, including Claudio Reyna, Jeff Agoos, Ben Olsen, John Harkes and Tony Meola. In addition to coaching, Arena served as the ACC soccer coaches chairman as well as two three-year terms on the NCAA Division I soccer committee from 1989 to 1995. On January 3, 1996, Arena left UVA to become the coach of D.C. United of Major League Soccer. The 1996 season would be both the team's and the league's inaugural season, so Arena needed to build a team from scratch just like the other 9 MLS club managers. To make his position even more difficult, he had agreed to coach the U.S. U-23 national team at the 1996 Summer Olympics in Atlanta, where it went a disappointing 1–1–1. Despite the distraction of the Olympics, Arena managed to form his team and lead United to an improbable comeback victory in the first MLS Cup at Foxboro Stadium. In addition to the MLS title, Arena also took United to the 1996 U.S. Open Cup championship. Arena and United continued to experience success in 1997. The heavily favored team won its second MLS Cup at RFK Stadium defeating the surprise Western Conference champion Colorado Rapids 2–1. Arena's success led to his selection as the 1997 MLS Coach of the Year. This year, Arena took United to the semi-finals of the CONCACAF Champions' Cup. In 1998, Arena took United to its third consecutive MLS Cup only to see his team fall to the expansion Chicago Fire led by his protégé Bob Bradley. However, while Arena failed to add another MLS championship to his resume, he guided United to the CONCACAF Champions' Cup title with a 1–0 victory over Toluca on August 16, 1998. He followed that with a defeat of Brazilian club Vasco da Gama to take the Interamerican Cup title. Arena was also the 1997 and 1998 MLS All-Star head coach. Arena was hired by the U.S. national team to replace Steve Sampson as head coach in October 1998 following the team's disastrous showing in the 1998 FIFA World Cup. His first game in charge was a friendly against Australia in San Jose, California on November 6, 1998. He then forged the team into a successful international side, and is the most successful coach in United States history: most international wins; longest home shut-out; best World Cup showing since 1930, reaching the quarterfinals at the 2002 World Cup, before a controversial defeat against Germany; and all-time best international FIFA Ranking (4th place, April 2006). Arena also won two Gold Cup championships in 2002 and 2005, with a third-place finish in 2003. The 2002 World Cup was the high point of Arena's career as the U.S. coach. Heavy underdogs coming into the tournament, they stunned the world by beating a respected Portuguese team 3–2 in their opening game. Arena was lauded afterward for instilling in his players the confidence to play aggressively against an international powerhouse. A hard-fought tie against host nation South Korea was enough to qualify for the second round, despite a poor loss against Poland in the final group game. Arena and the U.S. met old nemesis Mexico in the Round of 16, and Arena adapted his tactics to secure a 2–0 victory and a quarterfinal berth. The U.S. switched from their usual 4–4–2 to a 3–5–2, and it paid dividends almost immediately when Josh Wolff, who Arena had brought in to fill out the formation, set up Brian McBride for the winning goal early in the first half. Arena switched the team back to a 4–4–2 for their quarterfinal against Germany, and the team continued to surprise many by dominating stretches of the game. However, they went on to lose 1–0 on a Michael Ballack header. The U.S. national squad fell short of expectations at the 2006 FIFA World Cup, finishing last in Group E with losses to the Czech Republic and Ghana. The United States scored only twice in its three games, a tie against eventual champion Italy on an own goal by Italian Cristian Zaccardo and a goal from Clint Dempsey against Ghana. Some, including former team member and ESPN analyst Eric Wynalda, have blamed the poor performance on questionable coaching decisions by Arena, including not playing Clint Dempsey and putting DaMarcus Beasley on the right wing instead of his favored left against the Czechs, and using a defensive 4–5–1 in the must-win match vs. Ghana which the U.S. eventually lost. Another questionable decision was made when Claudio Reyna became injured after the first goal when Arena subbed in defensive midfielder Ben Olsen to replace Reyna. During his time as national team head coach, the United States rose in the FIFA world rankings from nineteenth to fourth, to the surprise, even, of U.S. players. Arena's 75 wins from 1998 to 2006 are by far the most in U.S. history. Nevertheless, three weeks after the Americans' disappointing first-round exit from the World Cup in Germany, the U.S. Soccer Federation announced that Arena's contract would not be renewed when it expired at the end of 2006. U.S. Soccer Federation president Sunil Gulati explained Arena's dismissal, stating that the U.S. was seeking a "fresh approach." Arena was eventually replaced as national team manager by his close friend and former assistant at Virginia and D.C. United, Bob Bradley. On July 14, 2006, USSF announced they would not renew Arena's contract with the U.S. national team. As a result, he began to pursue other coaching opportunities. That led to his being hired by Major League Soccer team New York Red Bulls. Arena's first match with the club came on August 12, 2006, in a friendly against FC Barcelona. On November 5, 2007, Red Bulls and Arena decided mutually to part company. During his year-and-a-half with the club, he went 16–16–10. He had two years remaining on his contract with the club. On August 18, 2008, Los Angeles Galaxy hired Arena to replace Ruud Gullit as head coach and Alexi Lalas as general manager. He inherited a team which had failed to make the playoffs since 2005 and would go on to finish the 2008 season at 8–13–9. The team finished thirteen out of fourteen teams and let in a league-high 62 goals to 55 scored. During the off-season, Arena reshaped the defense, drafting Omar Gonzalez and A. J. DeLaGarza who became fixtures on the back line and bringing in Donovan Ricketts as the goalkeeper. While the team scored only 36 goals in 2009, they also let in only 31. This led to a 12–6–12 record and second-place finish in the league standings. The Galaxy went to the playoffs and Arena was selected as the MLS Coach of the Year Award. The 2011 Major League Soccer season went extremely well for Bruce's Galaxy. His club won the Supporters' Shield for the second straight season, became only the third team in league history to reach the 60-point plateau, and won the 2011 MLS Cup in a 1–0 victory over the Houston Dynamo. Los Angeles also advanced to the elimination round of the CONCACAF Champions League. The Galaxy was, however, eliminated from the U.S. Open Cup in the quarterfinal stage. The club was undefeated in competitive matches at the Home Depot Center in 2011. The 2012 Galaxy repeated winning the championship again over Houston despite a slow start to begin the year. He would win a 3rd championship with the Galaxy in 2014 over the New England Revolution. On November 22, 2016, Arena was appointed as coach of the United States national team for the second time, replacing Jürgen Klinsmann after two disastrous losses in the first two matches of Hex qualifying round for the 2018 World Cup. On March 25, 2017, Arena led the USMNT to a trouncing 6–0 win over Honduras, followed by a 1–1 draw with Panama. On June 9, Arena led the USMNT to an important 2–0 win in a qualifying match against Trinidad and Tobago, followed by the USMNT's 3rd ever WCQ draw at Estadio Azteca against Mexico. In July, the U.S. won the 2017 CONCACAF Gold Cup 2–1 over Jamaica. Arena's team fell 2–0 to Costa Rica on September 1, but he coached the team to an impressive 4–0 rout of Panama on October 6 to get back into the qualifying third-place spot during the fifth round. On October 10, the U.S. men's national team needed a draw against Trinidad and Tobago to qualify for the 2018 World Cup. The U.S. were heavy favorites coming in as Trinidad and Tobago had lost six straight games, but the team fell into a 2–0 hole with an Omar Gonzalez own-goal and an Alvin Jones goal. While Christian Pulisic scored a goal, the U.S. could not score again and lost to Trinidad and Tobago 2–1. With the loss, along with both Panama and Honduras beating their opponents, the U.S. fell to fifth place in the CONCACAF region's final qualifying round and did not qualify for the FIFA World Cup for the first time since 1986. Three days after the team failed to qualify, Arena resigned from his position as men's national team manager. He said, "We have no excuses, we failed today. We should have walked off this field with at least a point." Arena has resided in the Los Angeles area since taking over as LA Galaxy head coach, having previously been based out of Charlottesville, Virginia during most of his coaching career. He is married with a son, Kenny Arena, who played with the U.S. youth national team and in Major League Soccer before becoming a coach. 1.^ Record includes league, cup, playoffs and CONCACAF competitions. During his tenure as D.C. United head coach, all shootout wins were put into their own separate column and all shootout losses were put under the loss column. During his tenure as United States head coach, matches that end in a shootout are considered ties. ^ "Arena, Bruce". Current Biography Yearbook 2010. Ipswich, MA: H.W. Wilson. 2010. pp. 15–19. ISBN 9780824211134. ^ Rosenblatt, Ryan (December 5, 2014). "All hail King Bruce Arena, American soccer's greatest coach". SBNation.com. Retrieved June 10, 2016. ^ FIFATV (October 16, 2014). "The USA's most successful manager" – via YouTube. ^ "Will America have to say auf wiedersehen?". Gainseville.com. Gatehouse Media. The Associated Press. June 17, 2006. Retrieved July 9, 2017. ^ "National Junior College Hall of Fame Inductees for '08". laxpower.com. Retrieved June 10, 2016. ^ Kwan, Alex (May 31, 2006). "U.S. men's soccer team is competing at World Cup in Germany, with Cornellian Bruce Arena at helm". Cornell Chronicle. Retrieved June 10, 2016. ^ "Meet the Tacoma Tides". Archived from the original on September 27, 2007. ^ "USA – Details of International matches 1970–1979". rsssf.com. Archived from the original on February 5, 2010. Retrieved June 10, 2016. ^ "Hidden caps: Bruce Arena". U.S. Soccer. Archived from the original on January 17, 2013. ^ "1974 U.S. Men's National Team – IFL World Champions". US Lacrosse. Archived from the original on January 14, 2005. ^ "1978 U.S. Men's National Team – ILF Runner-up". US Lacrosse. Archived from the original on November 23, 2007. ^ "FIFA adapting new world rankings". The Globe and Mail. Associated Press. June 2, 2006. ^ "Arena finished as U.S. national coach". MSNBC. July 14, 2006. ^ "Former U.S. coach Bruce Arena hired as Galaxy coach, GM". USA Today. August 18, 2008. Retrieved June 10, 2016. ^ Carlisle, Jeff (November 22, 2016). "Bruce Arena rehired as United States coach, replacing Jurgen Klinsmann". ESPN FC. ^ Goff, Steven (November 22, 2016). "Bruce Arena is named coach of U.S. national soccer team". The Washington Post. ^ Rosenblatt, Ryan (June 9, 2017). "Grading Bruce Arena in the USMNT's 2–0 World Cup qualifying win over Trinidad and Tobago". Fox Sports. Retrieved July 9, 2017. ^ "The Worst Loss in the History of U.S. Men's Soccer". FiveThirtyEight. Retrieved October 12, 2017. ^ "NJCAA Men's Lacrosse Champions" (PDF). NJCAA. p. 2. Archived from the original (PDF) on September 3, 2014.